Dr. Jerry Ramsey, author of Stealing Puget Sound. Our next monthly program promises to be an eye-opening examination of a slightly shadier side to our local history. Don't miss it! 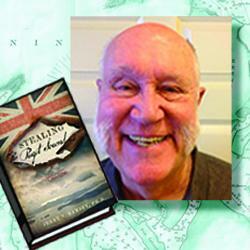 Tuesday, March 22nd, 7 pm- Stealing Puget Sound, 1832-1869, St Mary’s Episcopal Church, 10630 Gravelly Lake Dr SW. Noted educator, author and historian, Dr. Jerry Ramsey, will talk about his latest book, the subject of which is the occupation of Puget Sound by the British. The book will be available for sale with a book signing. Free to the general public, complimentary refreshments served.